The "whole new world" that Disney's live-action Aladdin will take viewers is apparently to the uncanny valley just outside of bizarro town. 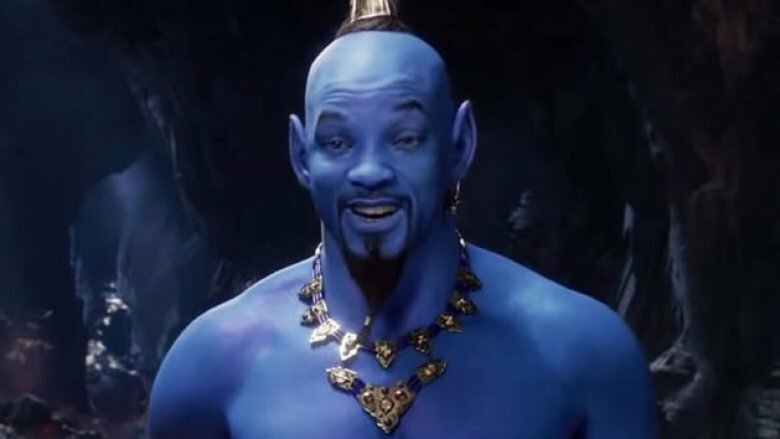 When the House of Mouse unveiled the second sneak peek at this year's Aladdin, a fresh take on the animated classic, so too did the studio reveal Will Smith as the Genie in his blue form. The footage treated fans to new glimpses of Mena Massoud as the titular street urchin who masquerades as a fake prince hoping to win the heart of a princess; tiny tastes of Marwan Kenzari as the deceptive sorcerer and Grand Vizier of Agrabah, Jafar, (and his scarlet macaw companion Iago); dazzling shots of Agrabah and the overflowing-with-treasures Cave of Wonders; and a peek at the first moment Aladdin meets Jasmine, portrayed in the new film by Power Rangers actress Naomi Scott. Disney saved the biggest reveal for last, showing in the final few seconds Smith done up as the blue-skinned, ponytailed, vest-rocking mystical entity that was trapped in a lamp for 10 thousand years. The extended look dropped as a surprise during the 2019 Grammy Awards on Sunday, February 10 — and it was only a matter of minutes before the internet shared their reactions upon seeing Smith's blue Genie look in Aladdin. People knew it was coming, as Smith promised fans that his character would have a human form seen in previously released promotional photos and a mystical form akin to that of the animated iteration of the Genie, originated by the late, great Robin Williams. But even so, nothing could prepare the world for what went down in the newest Aladdin trailer. Response to the new, blue Genie was (and this won't surprise anyone who knows even the slightest bit about social media and the things that can happen on the many varied platforms) have been intense, with countless people reacting in horror, flaming Smith's look, drawing admittedly hilarious comparisons between his character and other blue dudes from pop culture, and slamming the live-action Aladdin as a waste of money. "Dammit James Cameron, no one asked for more Avatar movies," wrote Josh Billinson of the Independent Journal Review in the caption of a screenshot of Smith in character. Kyle Buchanan of The New York Times was downright horrified at the vision of Smith as the Genie. "They premiered this image at night??? We are supposed to sleep after this??? I have never known peace," he wrote in the first of a series of tweets documenting his reaction to the new footage. Buchanan went on to admit that his terror slowly turned to twisted fascination: "The Will Smith genie makes me feel the same way I feel when a celebrity dies: Nauseous, sad, and like I can't wait to tell everybody about it. Did I scream? Yes. Am I pacing around my house now? Uh-huh. But am I also filled with… admiration? The ALADDIN movie is batting in the big leagues now. There are no other movies until this one and there may be no other movies after." He even joked that Smith as the Genie is what the never-shown-on-screen monsters of Netflix's Bird Box actually look like. "Honestly the Will Smith genie feels like a spoiler for BIRD BOX because I finally understand what image would make them so fascinated but also want to kill themselves," Buchanan tweeted. "I just stepped outside and… how are there not crashed cars? How are there not people walking around in a daze? Have they not seen the Will Smith genie yet? Dare I show them?" YouTuber Jenny Nicholson shared the same kind of guttural reaction to Smith's blue Genie as did Buchanan. She wrote on Twitter after watching the second look at Aladdin, "Will Smith genie is what appears in my room when I have sleep paralysis." Nicholson then wondered why Smith was so heavily CGIed for Aladdin, and why the filmmakers didn't simply place him in an interesting outfit instead of going through the trouble of making him blue. "Why is he so cgi, why did he even necessarily have to be blue. Aladdin and Jasmine have different outfits, why not just Will Smith in a cool genie outfit," she tweeted, raising a valid point about how easy it is for terrible CGI to completely ruin what could have been an amazing movie. Plenty took inspiration from Smith's long-running role on The Fresh Prince of Bel-Air as inspiration for the jokes they made at his expense on Sunday, riffing on the '90s sitcom's catchy theme song to highlight how ridiculous they feel Smith looks as the Genie. "Now I'd like to take a minute just sit down champ I'll tell you how I became the genie of this here gold lamp," one joked on Twitter. Another tweeted, "In-dustrial Light and Magic, born and raised, In a computer is where I spent most of my days. Coming out weird and rendered all blue, It's a nightmare version of Avatar Two." Writer and comedian Mike Drucker — who has worked on everything from Saturday Night Live to Full Frontal with Samatha Bee and has contributed to Marvel, Nintendo, The Onion, and IGN — also parodied the Fresh Prince tune when roasting Smith: "In ancient Arabia, bottled and raised, at the cave of wonders spending most of my days chillin' out maxin' relaxin' all cool grantin' wishes to street rats outside the school." Drucker's jokes didn't end there, though. The comedian quipped in a separate post that Smith "looks like the last character you unlock in a Final Fantasy game and you rarely use him because you've already leveled up the rest of your party." He then offered a chuckle-worthy juxtaposition of Smith's take on the Genie next to Arnold Schwarzenegger's Mr. Freeze from 1997's Batman & Robin, captioning the photo set, "Me when mom says I can have the house to myself vs when mom comes home early." Other reactions to Smith's Genie include the many comparisons made to a Smurf, Arrested Development character Tobias Fünke (David Cross) in his Blue Man Group audition get-up, Dwayne "The Rock" Johnson's Scorpion King from The Mummy 2, and King K. Rool from Nintendo's Donkey Kong video game franchise. Whether you're one of the seemingly very few people who think Smith looks great as the Genie, you're indifferent because "Genie already looked weird in the original Aladdin … because he's a genie," or you're dismayed at the fact that your children will probably recognize Smith's take on the character before they recall Williams' OG version, there's no avoiding the inevitable. Smith's Genie will bust out of the magic lamp in the live-action Aladdin soon enough, no matter if you find him shining, shimmering, and splendid or a thing of actual nightmares. Aladdin will open in theaters on May 24.